Louis Kinney was never one for quick decisions, and he certainly wouldn’t have claimed to see into the future. But at the end of his long life he had seen enough to sense where things were headed in Missoula’s Grass Valley, and to know that he wanted his love of the land to outlast his time on it. With each passing phase of the final years of his life, Kinney’s desire to protect his land grew increasingly urgent. While still living at home, Kinney set forth plans in his will to protect the land after his passing. One of Kinney’s first calls after moving into Grizzly Retirement Home, was to Five Valleys Land Trust. Kinney had changed his mind and wanted his easement done before he was gone. When Kinney checked into St Pat’s Hospital, he called on Five Valleys’ staff and his attorney. He asked that the easement they had been working on be brought to him immediately for signature while he was still of sound mind. Within hours, Kinney’s attorney and Five Valleys staff finalized the document and brought it to Kinney. Born in 1918, Kinney took ownership of his family’s historic farm in Grass Valley in the 1940s. He was elated to be the new caretaker of fertile soil that was (and still is) rumored to have never seen a plow and of extensive wetlands teeming with waterfowl and wildlife. Kinney knew it was one ranch of many that helped weave the cultural and historical fabric of western Montana. As Louis Kinney aged, he saw the valley grow up around him. He saw the area around his home on a dusty North Reserve Street transition from farms to box stores in just a few years. He watched an old trail once called Mullan Road turn into a busy commuting route. 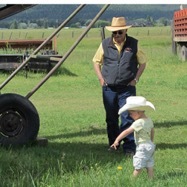 Kinney watched as the world changed around him, and although he didn’t know what changes were around the bend, he knew that even a changing world would always benefit from good farmland in good hands. By the time Kinney arrived at St. Pat’s he knew something about good hands. His friend Fred Deschamps had been taking care of Kinney for many years. When Kinney passed away just months after completing his conservation easement, he gifted his protected farmland to this good friend with good hands. Years later Fred and his son Brett are making a series of improvements to help this productive land reach its full potential. To support some of the traditional uses they are refurbishing old buildings, installing new pivots, and eradicating knapweed. To respond to recent changes in local agriculture, they are leasing several acres that grow fruits and vegetables for Missoula’s Farmer’s Market. They are also preparing to expand these farm plots, add an orchard, and build a fruit and vegetable stand along Deschamps Lane so that the family leasing these plots can sell their produce to local travelers. Louis Kinney could not have known how his land might be used in the future. But thanks to his vision and generosity—and to Fred and Brett’s continued stewardship—Missoula Valley has open ground that provides valuable wildlife habitat, preserves the historic working landscape, and nourishes our community.